Roman shades have a tailored appearance that complements many styles of decor. Use them alone or add cornices, curtains or draperies. Like roller shades, Roman shades are flat and smooth when down. When pulled up, they take up more space at the top because they pleat crisply instead of rolling. If you want the raised shade to clear the window completely, mount it at the ceiling. This also adds apparent height to the window. A system of evenly-spaced cords and rings on the back of the shade causes the shade to pleat when pulled. A weight bar near the bottom of the shade adds stability and aids smooth tracking. The choice of fabric affects the look of the finished shade. 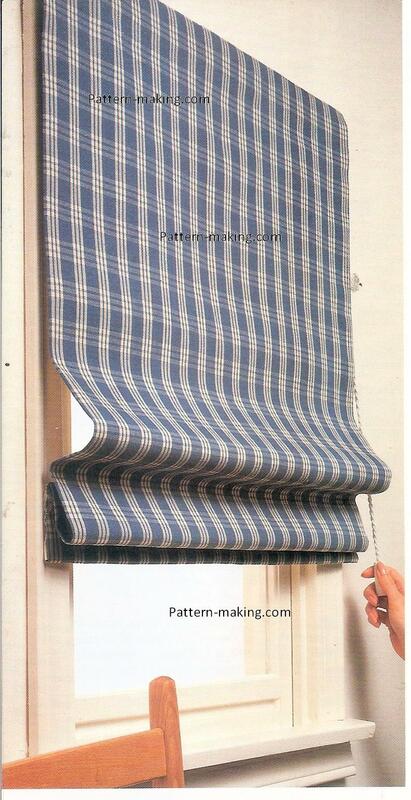 Sturdy, firm fabrics work best for the pleats of these shades. Lightweight, softer fabrics may be used, but the shades will be less crisp-looking. Roman shades are usually lined. 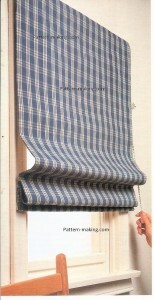 This gives added body to the shade, prevents fabric fading and gives windows a uniform appearance from the outside. You may need to seam fabric or lining to create enough width for the shades. Be sure to consider these seams when measuring for construction. Additional fabric may be needed to match a print,plaid or other design. To make measuring and construction easier and more accurate, use a folding cardboard cutting board on your work surface. Cutting Directions Determine width and length of finished shade. Cut decorator fabric for shade 3″ (7.5 cm) wider and 3″ (7.5 cm) longer than finished shade. Cut lining with width equal to finished width of shade; length equal to finished length plus 3″ (7.5 cm). Cut facing strip from lining fabric,S” (12.5 cm) wide; length equal to finished width of shade plus 2″ (5 cm). YOU WILL NEED Decorator fabric for shade. Lining fabric for lining and facing strip. , Mounting board, 1″ x 2″ (2.5 x 5 cm), cut to size for inside or outside mounting. Paint ends of board or cover with matching fabric. Screw eyes or pulleys, large enough to hold all the pull cords. Number should equal the number of vertical rows. Shade cord for each vertical row of rings.